The Centre for Jazz and Popular Music welcomes back Dutch saxophone quartet Artvark at the Centre for Jazz and Popular music on April 10 2019. 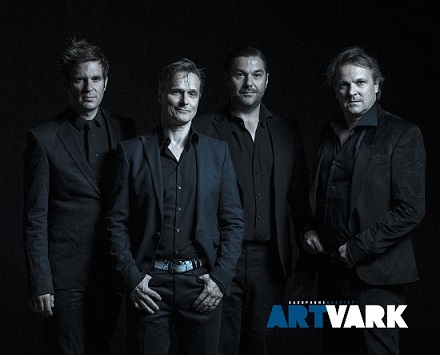 Rolf Delfos (alto sax), Bart Wirtz (alto sax), Mete Erker (tenor sax) and Peter Broekhuizen (baritone sax) blend their different backgrounds to form a unanimous, creative and unique sound; the sound of Artvark. Artvark has performed at major international festivals such as The North Sea Jazz Festival, The Cairo Jazz Festival, The Bohemia Jazz Festival in Prague, Jazz Bruges and toured in Ireland, Turkey and South Africa. Artvark meanders through musical traditions and slides across the stage according to an improvised choreography. Artvark stands for innovative original compositions, strong individual soloists and the adventurous groove of four saxophones. Artvark thrills, Artvark stinks, growls and sizzles. During 2014/2015 Artvark celebrated its tenth anniversary with a number of great events at diverse locations. It was in 2015/2016 that Artvark toured the Dutch theatres for two whole months with Dutch/Cameroonian jazz singer Ntjam Rosie. This led to the release of the CD/DVD Homelands. In the spring of 2016 Artvark took their sound on tour to South Africa for two weeks, delivering their music to jazz venues, university concert halls, and their workshops to students. After several intense and fruitful collaborations over the past few years, Artvark released a new album as a quartet: TRANCE. This time they bring one story, in one breath. The listener will be invited to join them on a fantastic journey. Departing from one note, the listener will be taken through a pulsing rhythm into a kaleidoscopic universe of different melodies, layered and overlapping one another. Artvark aspires to connect worlds and cross borders, both in themselves and their music. They tirelessly look for more, keep digging and rooting through the mud, looking for that one truffle. Artvark performs on April 10 at 18h00 (doors open at 17h30) at The Centre for Jazz and Popular music (CJPM), Level 2, Shepstone Building at UKZN Howard College Campus.